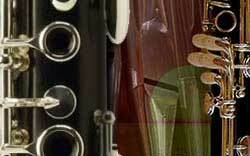 The clarinet, what a luxurious "objet d'art" ! The ebony inlaid body with silver keys is as beautiful visually as it is pleasant to the touch. The sound is produced by the vibration of a slender reed, creating a resonance in the column of air within the instrument. From the sensual and melancholic bass to the glistening high notes the sound springs clear, pure and individual. The doors of total orchestration open to Jean-Christian MICHEL : The clarinettist can then have both the the power and wealth of timbres of a full philharmonic orchestra, and the magical sounds of synthesizers. Playing in a small group, the clarinettist can give concerts where intimacy and immensity are equally expressed. In this pulsation which expresses the mysteries of infinity, Jean-Christian MICHEL links a being's depths to the sky's vibrations. CLARINET, ORGAN AND SYTHESIZERS AND RYTHMIC PULSATION. Jean-Christian MICHEL combines the resources of traditional Classical music with those of a sophisticated European Jazz. Thus he creates a music completely different from all others, marked by tradition and modernism. Among all the techniques involved in musical composition, instrumentation is not the least complex. Jean-Christian MICHEL, in common with many other musicians has thought about this fundamental element which represents sound : it is necessary indeed, to imagine which new magic will result from the combination of the colour and the register of the various instruments. Jean-Christian MICHEL allies timbres which are seldom heard together in a new sound alchemy. Instruments chosen in the orchestration answer criteria determined by a great deal of musical intelligence : You will understand by reading the paragraph below, why the composer decided to bring together clarinet organ and synthesizers. The CLARINET in the classical orchestra is near to and merges with the flutes, oboes and bassoons. The clarinet is, of course, widely appreciated as a soloist's instrument. The exceptional quality of its timbre allows the clarinettist to bring out, by prolonging his breath, the most imperceptible nuances during his interpretation. The sound's work still presents the supplementary advantage of a greater expressiveness. So, the sounds which Jean-Christian MICHEL tears from his clarinet seem almost comparable to those of a human voice, in as much as they seem moving, such as a long, torn and heart-rending cry. 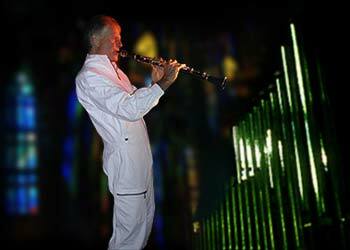 "One can only admire the magnificent sound of Jean-Christian MICHEL's clarinet : from a sweet sensitivity to the unreality almost imperceptibly played, MICHEL works his sounds, shakes them and vibrates them, whispers or cries them and has few equals in this art"... "Hamburger Abendsblatt"
The organ is a real orchestra. Its unique and warm brightness, its masterful power and its deep echos penetrate into the body. However the instrument is marked with its appropriate colour, and certain timbres are lacking to it. This is one of the reasons for which Jean-Christian MICHEL added the magic transparencies of synthesizers to his orchestration. The sythesizers, with their new sampled sounds, bring all the multi-timbral wealth of the classical orchestra. But more than anything, the brilliant voices that they allow to be designed, enrich henceforth the colour palette to infinity. A new sound results from that : The mixture of clarinet tones, organ and the magical synthesizer flute voices engender an unexpected and sensual sound alloy, rich in harmonics, warm and enveloping. The jazz pulsation always present in or suggested by the clarinettist's music, brings a vitality and a spontaneity which differentiate it from a certain austerity in Classical music. the concert performers playing in a SMALL GROUP benefit from an extraordinary precision in the execution. They then express themselves with a feeling and a supreme "density". The energy resulting from this cohesion arouses a brilliant interpretation, in a warm human dimension. * "THE JEAN-CHRISTIAN MICHEL'S CLASSICAL & JAZZ MUSIC CROSSOVER CONJUGATES THE PULSATION AND EXPRESSIVENESS OF JAZZ WITH THE RICH HARMONIES OF CLASSICAL MUSIC. CROWNED WITH THE SPATIAL PHOSPHORESCENCE OF A NEW SOUND, IT CONNECTS THE BEING'S DEPTH WITH THE MYSTERIES OF THE INFINITE." With Monique THUS, organ ; Sauveur MALLIA, bass.